Bangkok (NNT/VNA) - The ASEAN-China-UNDP Symposium on Financing the Implementation of the Sustainable Development Goals in ASEAN was held on August 21 – 22 in Chiang Rai, Thailand. The ASEAN-China-UNDP Symposium on Financing the Implementation of the Sustainable Development Goals (SDGs) in ASEAN brought together senior representatives from governmental agencies of ASEAN Member States and China, ASEAN sectoral bodies, prominent think tanks and representatives of civil society, the ASEAN Secretariat, UNDP, the private sector and the media. All participants visited Doi Tung Development Project and joined Doi Tung Conversation Project which was a direct interface between participants and local villagers, migrant workers, community/village leaders, local authorities, local business/chambers etc. in Chiang Rai. The Doi Tung Conversation focuses on four topics, including the 2030 Agenda for Sustainable Development, ASEAN Community, Financing and Investment for Sustainable Development and Sustainability. 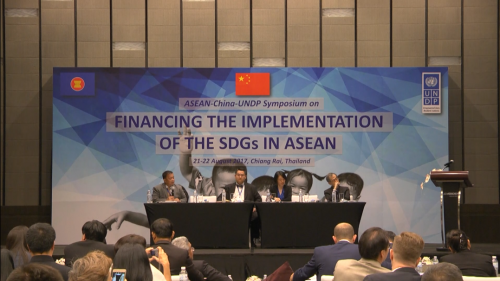 This Symposium provided a venue for ASEAN, China and UNDP to work together and support ASEAN Member States in effort to obtain more Integrated National Financing Frameworks for leveraging and managing finance of sustainable development as a priority task toward the Third Financing for Development.